The processes used by farmers to produce the food and fiber needed by our nation involve disturbing the earth to varying degrees depending on the type of tillage, planting techniques, and cultivation. Pennsylvania's Chapter 102 regulations, which address Erosion and Sediment Control, require that persons involved with earth disturbance implement Best Management Practices (BMPs) as part of an Erosion and Sediment Control Plan (E&S Plan) to minimize erosion and soil loss. The implementation of BMPs are especially important to farmers since their use protects the soil resource and keeps water clean. An Ag E&S plan meets the minimum requirements of Pennsylvania's Chapter 102 regulations. The PAOneStop online tool can be used to develop these plans. Additional information for use of the online tool can be found here. Private consultants can also be hired to develop an Ag E&S plan. A farm conservation plan is a "Whole Farm Plan" which considers all resource concerns on the farm, including but not limited to Ag E&S. The BMPs incorporated into a conservation plan reduce soil loss to a level where soil productivity is maintained. 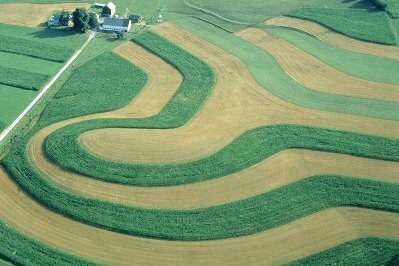 "A Conservation Catalog for Pennsylvania" features soil-saving agricultural BMPs for the conservation of Pennsylvania's natural resources, such as contour farming, contour strip-cropping, cover crops, grassed waterways and other common farming practices. Click here to view A Conservation Catalog for Pennsylvania. The conservation plan also includes computations to show that stormwater runoff from the farm for a 10-year frequency storm (one which produces about 4.8 inches of rain over a 24 hour period) will not cause erosion or deposit sediment into local streams or other water bodies. The conservation plan should be available at the farm at all times to guide the persons responsible for overall farm operations. If major changes occur in tillage operations, the conservation plan is updated. Farmers also need a conservation plan consisting of a plan map, a soils map, and a narrative. The plan map shows the farm boundaries, field boundaries, use of each field, acres in each field, and permanent conservation measures installed and/or planned. The soils map indicates the kinds and boundaries of soils. The plan narrative includes names, units and amounts, and locations of each of the conservation practices being used. The U.S. Department of Agriculture's Natural Resource Conservation Service (NRCS) and the District cooperate to provide technical services in developing farm conservation plans.